While Apple products have traditionally been seen as the ideal choice for creative media types, the iPad and iPhone are also useful business tools. The iTunes store offers a number of apps focused on productivity. Amongst the most popular options are the mobile versions of Apple's iWork suite (Pages, Keynote and Numbers), which can be used for word processing, spreadsheet and presentation creation on the go. Never to be outdone, Microsoft has also released official iOS versions of its own office suite such as Microsoft Word for mobile. In this guide you'll discover more about these and other office apps for your portable Apple device. Some of the programs covered include features beyond basic tools, such as the Documents app, which comes with its own photo album. Other apps only perform basic tasks such as word processing but do so in a more efficient way than more well-known options. Polaris Office is a free office suite that runs across all platforms. It also has a handy iPhone and iPad app that lets you access your documents from anywhere. Everything you need is in one handy application. Polaris Office is fully compatible with MS Office and supports most file types such as ODT, PDF, PPT, DOC and XLS. Within the app you can open all file formats including PowerPoint and Excel. All of these formats can be opened, edited and saved through the application. The app is light on storage space, weighing in at 163.3MB compared to Microsoft Word's at 362MB. The app also supports writing with pen and the use of pointer features meaning you can draw and edit as if you were writing on actual sheets of paper. You can view PDF's directly from your iPhone or iPad and can easily convert them into another format to edit them. There is no need to extract files with Polaris Office, you can view them through the app. It comes with 1GB of Cloud storage of its own but you can connect your own cloud storage provider with it in order to gain more storage. Polaris also supports over 18 languages. One of the main criticisms of the free app is the ads that can interrupt the service. However, this can easily be resolved by purchasing the remove ads option for $3.99. There are also several different price tiers starting at $5.49 per month that will give you access to more cloud storage and annotation on PDF. All payments are based on a recurring subscription and will automatically renew. While PrintCentral is primarily a printing app it's capable of much more. The app also works as a full office suite which offers print support. PrintCentral has its own browser that allows the user to print to any wireless printer that is in range. As well as this you can print PDF and any iWork files as well as any MS Office files. The app contains its own mailbox utility that lets you view multiple inboxes on the same page. It also supports signatures with images and in varied formats. Within the app users are able to Zip ad Unzip files to print or to view them. While working online you can copy and print webpages while retaining their original format. PrintCentral is fully integrated with Evernote and also allows users to connect to their own Cloud storage providers such as Dropbox and iCloud. Some users have noted that at times it can be tricky to get the app to locate your chosen printer but this does not seem to occur very often. The app is $4.99 to buy, but also offers an in-app Advanced Upgrade which costs $2.99. GoodReader was developed by GoodiWare Ltd which was started by Yuri Selukoff. It was first released in 2010. The iPhone and iPad app costs $5.99. The app can read and view documents in different formats such as DOC, PDF and XLS. It is mainly a PDF reader and within it you can make changes to PDF documents. GoodReader enables users to read, edit and sign PDF files. From here you can also make annotations within your PDF document such as highlighting and drawing. Signing PDF documents only takes three taps. The app makes everything very simple. You can store your data simply and efficiently though cloud providers such as Dropbox and OneDrive. GoodReader also supports copy and paste along with the ability to Zip/Unzip and unRAR files and folders. Any users of the old version can use a migration assistant that will help to move files to the new app seamlessly. Users new to GoodReader will enjoy the text-to-speech feature which supports a large number of languages. Documents for iOS is developed by Savy Soda who are located in Melbourne, Australia. The app is a fully functional office suite that costs $4.49 to install and weighs in at 42.6MB. Documents works with Dropbox, OneDrive and Google Drive to give users optimal storage. Editing can be done both online and offline. The app includes a Text Editor, a spreadsheet app and a file manager. With the use of all three this gives users the ability to open all MS Office files along with full compatibility with iWorks. It fully supports all TXT and CSV files but there is limited support for DOC and XLS files through Google Docs. Included within Documents is a Photo Album tool which helps users to manage their photos easily. Spreadsheets are fully functional and supports all formulae, formats and basic features associated with Excel. Files that you create within the app can be opened by Notepad, OpenOffice, and Word amongst others. This appears to be a popular app with users having very little to criticize about it. However, one of the few complaints is that there is no ability to search within a document and that it always requests you save a document whether you have made changes or not. Microsoft Word or just simply Word first entered the fold in 1983 as a multi-word tool for the now defunct Xenix system. Since then it's held the dominant market share when it comes to office tools and is the most well-known amongst users. The Word app is free to download but offers in-app purchase for any extras you may need. This is not a lightweight app: it weighs in at 292.1 MB upon installation. Within Word you can create, edit, view and share files with other users quickly and easily. You can read through PDF's but need to convert them into a Word document before being able to edit them. Word has many trusted features that let you edit and create documents with ease. While you may not always need them, it is good to know you have the choice. The app has several templates that make writing resumes or cover letters much more convenient. While this is a very popular app there are some issues with stability, with some users noting that Word documents freeze up during use with work sometimes being unrecoverable. Other users have criticized the size of the application stating that it is too resource heavy. Pages is part of the iWork productivity suite and is developed by Apple. However, the suite can not be installed in one handy app but is divided up into three separate apps: Pages (word processor), Numbers (Spreadsheet software) and Keynote (presentation software). Each app is free to download and Pages itself weighs in at a mighty 515.4 MB. Pages can open DOCX, DOC, RTF and TXT files. It can export files through PDF, DOCX, RTF and EPUB. If collaborating with users of Microsoft Office, you will need to convert the file into either a PDF or DOCX file before sending as it is not fully compatible with MS Office and can cause readability issues. You can annotate and draw within documents using the Apple Pen. This is an easy to use tool that allows you to add drawings in several different ways besides the Apple Pen e.g. 'fill tools'. Pages also has its own Apple designed templates for letters, resumes and posters which are easy to use. With the collaboration tool users can see exactly who is working on the document at the same time as them, can share the document publicly and can easily follow other users edits. It is also available on documents that are stored in iCloud. The general consensus amongst users is that the app should be more compatible with MS Office. Even though you can convert documents into DOCX files, they can still appear different in MS Office. Google Drive is a file storage service developed by Google. Users can store and share files in their drive as well as synchronize files across devices. It is free to download and offers in-app purchases. The app incorporates Google's office suite (G Suite) which includes Google Docs, Sheets and Slides. This means that documents stored on the drive can be viewed, edited and created. Any changes will be saved to Google Drive. You are given 15GB of free storage which can be upgraded through paid plans which start at $1.99 (£1.52) per month. Users can edit the privacy settings for each file as they see fit. This is especially handy if you want to collaborate with other people. All files that you have saved to your drive, such as documents, spreadsheets and photos, will be backed up safely so you won't have to worry about losing them. There is a handy search feature where you can either search for files by content or name. Users are also able to see any recent activity on a file and can set sharing permissions to comments, edit or read-only. Users have criticized the layout of Google Drive stating that organizing files/folders can be confusing as the documents all look the same and are categorized by most recent activity and not alphabetically. SmartOffice claim to offer the most accurate representation of Microsoft Office products that can be seen on a mobile app. The app is $9.99 to buy and install and weighs in at 52 MB. For this you are getting a full office suite unlike Microsoft Word which, at 361.1MB, is just the word processing tool. The app offers password protection so that you have extra security when saving any documents you have been working on. Users can edit and share Microsoft documents easily and efficiently. All files can be converted to a PDF if needed. Documents can be opened and saved online with access to the likes of Dropbox and Google Drive. SmartOffice supports several image formats such as PNG, JPEG, GIF, TIFF and BMP. Wireless printing is also supported. It is compatible with all versions of Word since 1997 and supports over 35 different languages. It is easy to use with a well-designed, attractive interface. SmartOffice has an excellent spreadsheet and presentations tool that is comparable to MS Office. 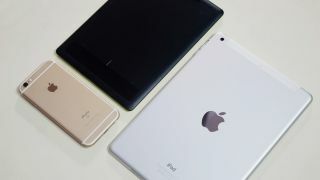 Users have criticized the iPhone and iPad app for being slow to log in and hard to navigate through. Microsoft's Office Lens is a companion app to OneNote which allows users to scan whiteboards and documents with the intention of saving and making them readable. It is free to install and weighs in at 40 MB. This may not be a full productivity suite but it can be a very handy office tool. It is a great app for those constantly on the go as it can read whiteboards, blackboards and business cards. It then digitizes them automatically. This means that users never have to worry about losing receipts, just scan and save them in the app. OCR will recognize both printed and handwritten text and you can search for words within your images if you need to edit them. Office Lens will tidy up and do its best to eliminate glare when using the 'Whiteboard' mode. While the 'Document' mode ensures that colors match perfectly and also tidies up the image to fit the file. After taking a scan of a business card, the app can extract certain information such as contact details and save them to your address book. Images can be converted to DOCX, PPTX or PDF files and are saved to OneDrive automatically. It seems that the 'Flash' option has to be turned off each time you use Office Lens, which some users have said can be inconvenient especially if using in a classroom or office meeting. WPS Office (Writer, Presentation and Spreadsheets) is an office suite developed by Chinese software developer Kingsoft. The suite is available on both iPhone and iPad. The app is free but ad-supported, though you can remove these by paying either $3.99 a month or $29.99 a year. The suite's comprised of WPS Writer, WPS Presentation and WPS Spreadsheet. The app allows you to securely encrypt your files with passkeys and you can edit your documents without the fear of losing your work with the auto-save option. Features include the ability to track changes, comments and run spell checks. The app can present documents straight from your iPhone/iPad to a compatible TV or projector. WPS for iOS also supports 47 different languages. It seems that if do not purchase the premium subscription within the app then you will be plagued by intrusive ads while using the service. There are a number of other office apps available in the Apple iTunes App Store, but there are some which try to do everything Microsoft Office does, and others that feature only in one area. We'll therefore expand the list a little to look at additional alternatives to consider. Google Docs: Sync, Edit, Share is another obvious office app for iOS, which works within Google's G Suite app platform. You can write, edit, and share documents in Google Docs, and additionally work on them collaboratively. Documents are also saved in the cloud, and there are integrations available with the rest of Google's G Suite, not least spreadsheets and G Drive. While it's not as feature-packed as Microsoft Office, it has enough features to get most jobs done, and as it's free to download it's a useful free option to consider. OfficeSuite & PDF editor works by allowing you to create, edit, and save Word, Excel, and Powerpoint files. As ever, everything is saved in the cloud so you won't lose your files easily. There are also additional PDF editing options which is handy to have, and with a file size of 153.7 MB it's a lot smaller to download and install than Microsoft Office for Apple. Zoho Docs is another free document editor available in the iTunes App Store, and aside from offering the standard create/edit/save document options, also allows for collaborative working on them. You can also tag files to make them easier to find, as well as sync to save using multiple storage providers. It's free to download, and easily integrates with other Zoho productivity apps.